Origin and Habitat: Coryphantha pseudoechinus is endemic to Coahuila (Casas Coloradas, San Jose de la Paila, Zona de Minas, north of Estacion Marte, Mount Paila, Las Palomas, San Pedro, El Sacrificio, Parenos, Cuatrocienegas-San Pedro de Las Colonias, west of Hipolito), Mexico. There are more than 20 subpopulations, and the species is locally common. Altitude: 700-2200 metres above sea level. Habitat and Ecology: The species is found is xerophyllous scrub on calcareous soils. 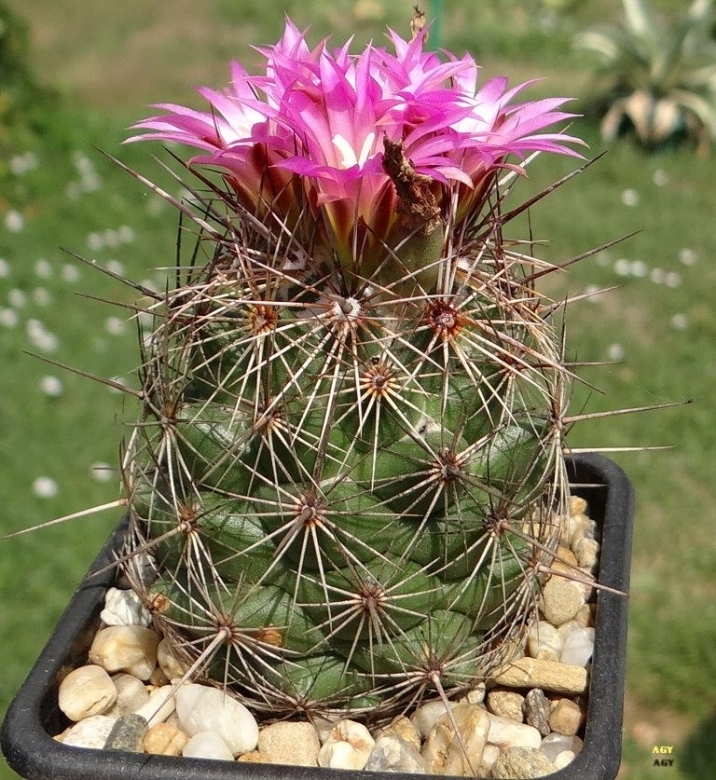 Other commonly associated plant species in the habitat include Astrophytum senile, Astrophytum niveum, Mammillaria grusonii, Echinocactus horizonthalonius, Thelocactus bicolor, Coryphantha runyonii, Epithelantha micromeris, Ferocactus hamatacanthus, Echinomastus durangensis v. mariposensis, Echinocereus pectinatus and Lophophora williamsii. Some subpopulations are affected by trampling by goats and other livestock. 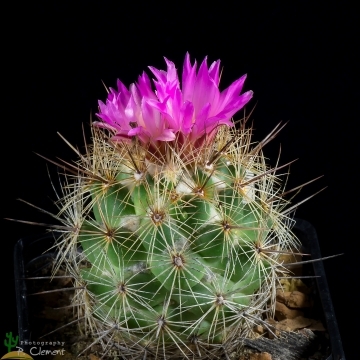 Description: Coryphantha pseudoechinus, fistly described by Bodeker in 1929, is an egg-shaped cactus species solitary when young, then freely branching to form low clumps. This species produces flowers all through spring and summer and seed pods at the same time. These can be seen starting to develop before the withered flower remains fall. The flower is violet-pink and 2.5 cm. long and about 3 cm. broad depending on the heat of the sun. The fruit is dull purple about 12 mm, long and slightly rounded. The seed is brown. Two susbpecies are recognized, the typical form and susbp. laui (L.Bremer) Dicht & A.Lüthy. 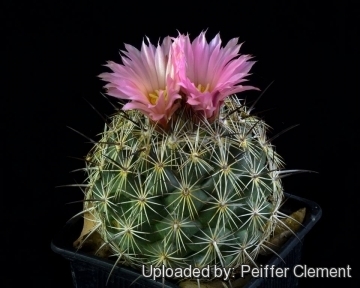 Derivation of specific name: Coryphantha pseudoechinus Bodeker so called to distinguish it from Coryphantha echinus Engelmann which it much resembles ; the brilliant yellow flower of the latter however is very different from the smaller crimson blossoms of the former. Stems: Ovoid to short cylindrical, sprouting from the base, forming large groups, dull leaf green, becoming grey-green with age, 7-12 cm long, 4-6 cm in diameter apex slightly depressed with some wool. Tubercles: In 5 and 8 series, conical, somewhat flattened on the upper side, rhomboid at the base, strongly ascending, to 12 mm long, with sharp, narrow groove, woolly in youth. Some yellow nectar-glands are only produced during active growth and formation of buds and this immediately behind the spine-bearing areole only. Axils in youth woolly. Areoles: Round, 2 mm diameter. Central spines: (0-)1(-3), conspicuous, ascending in the direction of the tubercle axis, some subcentral displaced laterally or even slightly down-wards, very rigid, brown or black, soon greyish and frosted, 13-20 mm long. Radial spines: 18-20(-25), straight, stiff, needle-like, grey to white to reddish brown, sometimes black tipped, 8-15 mm long. Flowers: Situated near apex, often numerous and opening at the same time, flattened funnelform, pale rose pink to bright magenta, 2-2.2 cm long, 2-3.5 cm in diameter. Outer perianth segments lanceolate, dark red-brown with a rose margin, greenish at the base up to11 mm long. Inner perianth segments narrow lanceolate, violet-rose, lighter towards the base up to 22 mm long. Filaments numerous, whitish, anthers yellow. Style whitish with 5-6 whitish stigma lobes. Fruits: Oblong, ovoid, with attached flower remnants, pale yellowish green to bronze to pinkish, to 15(-23) mm long and 7 mm wide. Seeds: 1 x 1.2 mm, reniform, smooth, brown, reticulate. 1) Gómez-Hinostrosa, C. & Hernández, H.M. 2013. Coryphantha pseudoechinus. In: IUCN 2013. "IUCN Red List of Threatened Species". Version 2013.2. <www.iucnredlist.org>. Downloaded on 20 March 2014. Cultivation and Propagation: In culture Coryphantha pseudoechinus is without problems, and regularly shows its large yellow flowers. It does best in slight shade, but does well in full sun too. It is sensitive to overwatering (rot prone), and needs a very porous soil with good drainage. It flowers quite early, but needs about 8-12 years to reach the typical, definite outlook. It tolerates fairly low temperatures as long as it is kept dry (hardy to -5° C or less for short periods of time).